"Wonderful served warm with ice cream...brings back wonderful memories of picking berries and sitting down at the table with my family. Works well with fresh or frozen fruit. You can also use black raspberries, peaches, cherries...a new favorite is 2 cups fresh peaches and 2 cups fresh blackberries!" Preheat an oven to 425 degrees F (220 degrees C). Grease a 9x13-inch baking dish. Place the blackberries into a large saucepan; add the cornstarch and 1 1/2 cup of sugar. Pour in the water, and bring to a boil over high heat, stirring constantly until the berries have thickened, about 5 minutes. Pour into the prepared baking dish. Whisk the flour, baking powder, salt, and 2/3 cup of sugar together in a mixing bowl. Cut in the margarine until it is the size of peas. 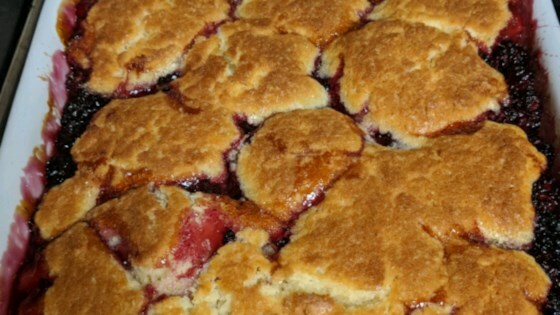 Stir in the milk until a soft dough forms, then drop by spoonfuls onto the hot blackberry topping. Bake in the preheated oven until golden brown, 30 to 45 minutes. I cooked the berries on the stove longer it wasn't as watery. My husband and i really enjoyed this!! Easy Peasy to make and it's beautiful too! Just sweet enough with my rather tart blackberries. I feel quite sure that I will be making this again! completely amazing. tastes like what my grandmaw used to make.